New Delhi, February 23: Schools from across India were among the top ten green schools of India after an extensive audit of the environment-friendly practices followed in these schools. The winners included schools from Noida, Delhi, Sikkim, Rajasthan, Rajasthan, Punjab and Himachal Pradesh. More than 500 schools from India, covering most states and Union Territories of India, are part of the Green Schools Programme and participated in the event. CSE Director General SunitaNarain and theatre and film personality Tom Alter gave away the awards at a ceremony today at New Delhi. Schools from the National Capital Region – three in Delhi and one in Greater Noida – were among the top 10 green schools in the country. The top prize went to Father Agnel School, Greater Noida, the second prize to Queen’s Valley School, Dwarka (Delhi) and the third to the Government Senior Secondary School, Devnagar (Shimla).Two schools from Sikkim made it to the top ten. A few winning schools – from Himachal Pradesh and Punjab – could not receive their awards as connectivity to Delhi has been affected due to the ongoing agitation in Delhi’s neighbourhood. The awards have been given on the basis of a detailed assessment of environment-friendly practices such as rainwater harvesting, proportion of green area in school, waste management, water management and sanitation practices, availability of health-promoting food in the canteen, among other practices. Encouraging school children who have led environmental work in their schools, Narain said, “Green practices should be a part of our life not because they get us points, but because they are correct.”Congratulating schools for keeping their waste at a minimum – a criterion for the awards – she said this should not increase. Lamenting that schoolchildren could not follow some environmental practices such as walking or cycling to school, she said, “This is a reality of our cities that if you cycle or walk to school, you may meet with an accident.” She hoped it would be possible to rate states on the basis of their policies – whether they were environment-friendly or not. Challenging children to be green warriors, Alter said the path was strewn with difficulties and that it was not easy as they would face opposition. “Telling someone not to litter, or not to waste resources will get you into trouble – like it has got me into trouble several times – but if you take up this challenge, you will do a great service to everyone,” he said. Alter also said it was important to segregate ‘progress’ the way we segregate waste. Reminiscing about his school – the Woodstock School, Mussoorie–he said it was a green school, being located in hilly forests of Mussoorie. He said the walk from the dormitory to the school building was on a beaten track through a forest. Alter rued wistfully that the path had been converted into a cement path now. “Earlier, you could know the seasons from the way the path felt under your feet, now you cannot because cement is the same in every season,” he said. 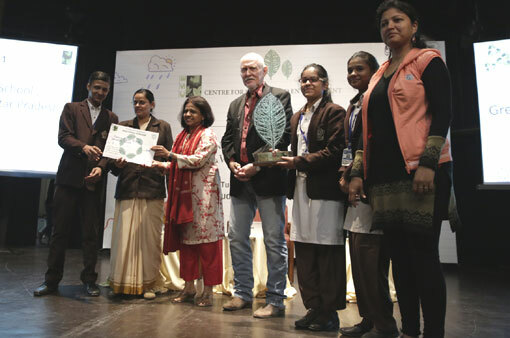 Speaking about the process followed in selecting the winners, Ranjita Menon, Director of CSE’s Environment Education Unit that runs the Green Schools Programme, said for this year’s awards, an online application system had been followed. CSE also launched a new interactive website, www.greenschoolsprogramme.org which will connect schools across India on green initiatives.